Celebrate a loved one or add a touch of color to your home with these twenty distinctive flower arrangements. Inspired by the elegant and minimalist style of ikebana (the art of Japanese flower arranging), and constructed using the techniques that promote the functionality and portability of Western designs, these arrangements place sophisticated style into small containers that are easy to move from room to room or to the hands of a friend. Illustrated with beautiful photographs, each arrangement uses just a few easy-to-find floral materials and Western tools and materials. Clear step-by-step instructions with photographs, along with a range of tips and techniques on manipulating and using the materials, are sure to broaden the skills of both beginners as well as those already familiar with the floral arts. Make the arrangements in this book and share the gift of flowers with your friends and family. Keiko Kubo grew up in Japan, where she took ikebana classes with her mother as a teenager and eventually went on to obtain her teaching license for ikebana. After graduating from college, Keiko came to the states to pursue studies in art and graduated from the School of the Art Institute of Chicago with a master of fine arts in sculpture. While in graduate school she also studied Western floral art. Her style is a unique blend of these three major influences: traditional ikebana, Western floral arrangements, and sculptural art. 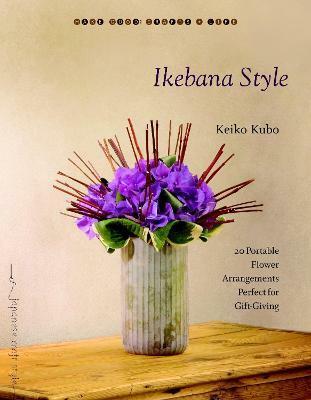 She currently lives in Chicago and is the author of Keiko's Ikebana (Tuttle, 2006).